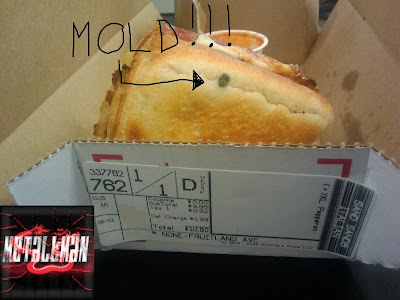 Do Not Eat At Dominos Pizza!!! Ohh. That's very poor service on part of Dominos. Imagine if the coworker had actually eaten that!! Um, I'll eat, but won't pay for it. With all the swine flu around, a little penecillin with your food won't hurt. After working in the restaurant business on and off for over 10 years, I have a very hard time eating out. I know what goes on in the kitchens. Holy crap man! That's just unacceptable. Eeew! You should sue them! Stupid thing to do! I also know a few stories from my hometown that retaurants have had some odd things with the food..
And when the word goes around you know what people do.. they wont go there anymore!! So not so very wise things to do. Glad we don't have a Dominoes close to us! Sad, because they used to be very good a lonhg time ago. well i dont really buy dominos or carls jr, i heard from a teacher that they found or help out the minute men. i forgot the exact details though. but yea. fast food is just i dont know hard to trust now a days. Ugh. Definitely glad that I'm a supporter of local pizza chains right now. Peppino's and Tony's FTW.